The next Salon will be March 8th– check out the calendar of events for more info! Salon duc Tape meets the second and fourth Friday of each month at 7:00 p.m at FoCo Cafe. Check out our calendar of events for the upcoming topics and presenters. The Salons are on summer break but will resume August 24, 2018! The presenter will be announced two weeks prior, so check back soon! There are speakers, films on occasion, but always discussion. 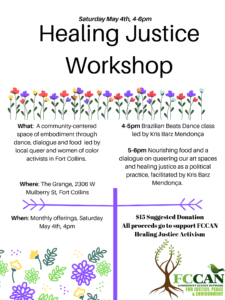 Fort Collins Community Action Network has long acknowledged our general need for meaningful, face-to-face conversation and that it is the lubricant for connection and community. Salon duc Tape was created in 2003 after a group of Fort Collins activists came together and decided that duc tape and an engaging conversation build, stick, repair and hold things together.